ClarityCap Solen & Alcap capacitors, audio components for loudspeaker crossovers. Audio Capacitors by Solen, Claritycap, Alcap 50V and 100V and Alcap Low Loss Capacitors, for all audio and hi-fi loudspeaker crossover applications. Solen 400V and Solen 630V SCR Fastcap Polypropylene range is made to Solen’s Fast Cap Audio Specification - as specified by HiFi World in their Kits and used by many top HiFi manufacturers. Alcap ranges (Elcap replacement) stocked include 50V Standard, 100V High Power and Low Loss 50V for highest quality HF Section needs.A full range of excellent value for money Solen 400V and Solen 630V Polypropylene Capacitors is available including some special values made especially for Falcon Acoustics. Claritycap ESA250V range premium audiophile capacitors in 3% or 1% tolerances. 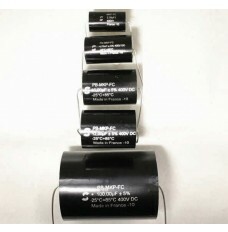 We also stock a wide selection of hard to find capacitor types and values. Special tolerances can be ordered on-line. All capacitors are tested for tolerance before shipping. Capacitors are sold in Voltage or Value ranges. You are able to select the capacitor Category range, the Value Range or Series type/Brand required from the Buttons below or the Menu Column on the left - you can then select the value and specify the tolerance you require. Tolerances Capacitors are normally manufactured in batch production runs to tolerances of ± 20%, ±10%, ±5% or ±3% of nominal value depending on type. Where a higher tolerance is ordered capacitors are hand-selected within batches to meet the ordered tolerance at 1KHz against nominal value using industry-standard calibrated B&K Deviation Bridges, QuadTech or Racal LCR Bridges. The nominal tolerance printed on the capacitor does not change. Please note that most hand-held multimeters do not measure electrolytic capacitors at the correct test frequency and readings obtained are therefore unreliable.